Observers in the British Isles and western Europe with a clear sky low to the east around 10pm local time on Wednesday, 27 January can see the rising 18-day-old waning gibbous Moon in a close conjunction with Jupiter, the solar system’s largest planet. In binoculars and small telescopes you can see the changing configuration of Jupiter’s four large Galilean moons (Io, Europa, Ganymede and Callisto) from night to night as the planet draws steadily closer to Earth and grows in apparent size over the coming weeks. AN graphic by Ade Ashford. While you could easily be forgiven for thinking that all the planetary activity is happening in the morning sky, don’t forget that Jupiter is now less than six weeks from opposition, so the period that it lies closest to Earth is fast approaching. This means that the largest planet in the solar system (that we know of!) is currently rising in the east before 9pm GMT for an observer situated in the heart of the UK. Jupiter currently lies 435 million miles (700 million kilometres) from Earth, shines at magnitude -2.3 and measures 42 arcseconds across its mighty equator. 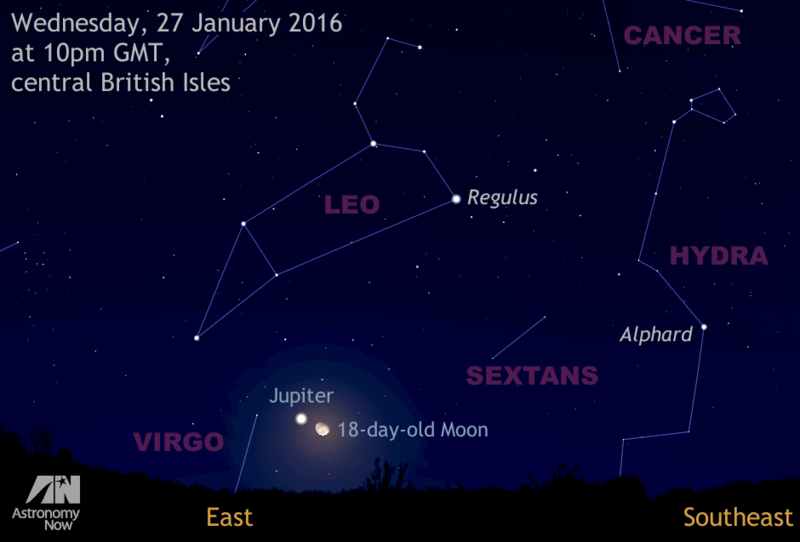 If there were any doubt as to the identity of the bright object currently low in the east around 10pm GMT seen from the British Isles, then a very convenient celestial marker in the form of the 18-day-old waning gibbous Moon makes a close pass of Jupiter late on the evening of Wednesday, 27 January. As the illustration above depicts (albeit with the Moon slightly enlarged for clarity), the pair will be separated by just under two degrees and lie in southern Leo bordering on Virgo. This means that the Moon and Jupiter will appear in the same field of view of binoculars and telescopes magnifying 25x or less. While higher-power binoculars of the 12x to 15x variety will show Jupiter’s four large Galilean moons Io, Europa, Ganymede and Callisto — particularly if you steady your elbows on a low wall or fence — a telescope of 10cm (4-inch) aperture or larger employing magnifications of 100x and greater will reveal a lot more. This illustration shows the configuration of Jupiter’s four main Galilean moons — Io, Europa, Ganymede and Callisto — relative to their parent planet late into the night of Wednesday, 27 January. The aspect is north up and east to the left, matching the correct view of a powerful binocular. Users of refractors and catadioptric telescopes (Schmidt- and Maksutov-Cassegrains) with a star diagonal will have to mirror the view left-right, while Newtonian/Dobsonian users need to rotate the view 180 degrees. AN graphic by Ade Ashford. If you consult our interactive Almanac, you can obtain predictions of when these four moons will pass in front of Jupiter (termed a transit), or when their inky-black shadows drift across the face of their parent planet — events called shadow transits; the latter are easier to view. 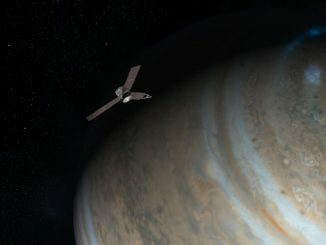 Although no shadow transits of the Galileans are visible from the UK on the night of 27 January, keep watching outermost moon Callisto as it crosses the northern polar regions of Jupiter from 12:05am to 1:55am GMT on Thursday, 28 January; the planet’s Great Red Spot is well placed at this time too. 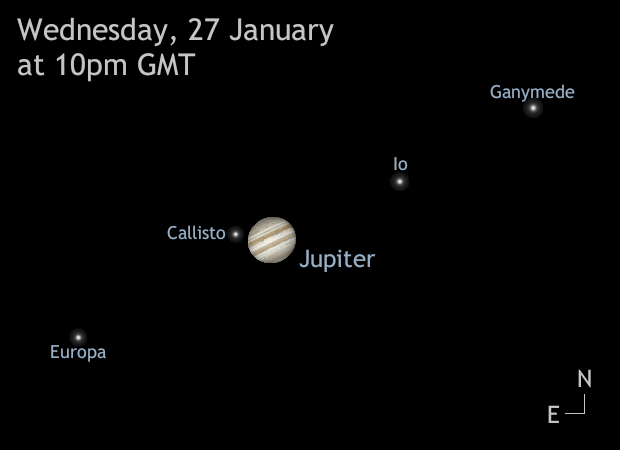 The shadow of Europa also crosses Jupiter from 8:50pm to 11:40pm GMT on 28 January. Find out more about how to observe the Moon, Jupiter and the other planets in the night sky in the January 2016 edition of Astronomy Now. 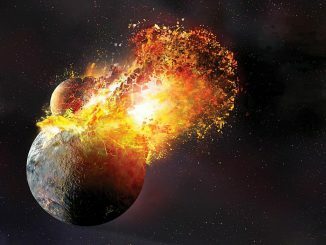 A giant mound near the Moon’s south pole appears to be a volcanic structure unlike any other found on the lunar surface, according to new research by Brown University geologists. 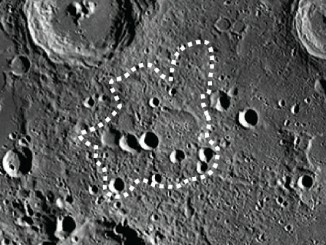 The formation, known as Mafic Mound, stands about 800 metres tall and 75 kilometres (47 miles) across, smack in the middle of a giant impact crater known as the South Pole-Aitken Basin.